High visibility patrols are taking place in Leeds city centre today to mark the official launch of a policing tactic designed to disrupt crime and terrorist activity. Trials of "cutting-edge" initiative Project Servator have been taking place at Trinity Leeds since September, with increased numbers of uniform and plain clothes patrolling at unpredictable times. West Yorkshire Police says those trials resulted in nine arrests for offences ranging from burglary to drugs as well as the recovery of a number of weapons and drugs including spice. The force also received numerous pieces of intelligence, including reports which were passed to the counter terror unit. Now the model is to be rolled out across the entire Leeds district. Assistant Chief Constable Russ Foster, of West Yorkshire Police. Assistant Chief Constable Russ Foster, of West Yorkshire Police, said: “We worked for many months to bring cutting edge Project Servator tactics to West Yorkshire and have been pleased with the impact it has had in Leeds city centre. 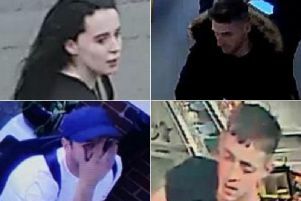 “Residents and businesses have been keen to speak with our officers and we have received numerous pieces of intelligence about criminality which is in the process of being developed into investigations." He said Project Servator was all about making it hard for criminals to operate while, at the same time, reassuring the public. “From now on our Project Servator officers could deploy anywhere at any time across the Leeds district," he said. Specially-trained officers in uniform and plain clothes carried out unpredictable and highly visible police patrols during the trial. Mounted police were also in the city centre today as part of the high visibility patrols. They were supported by other police resources, including firearms officers, police dogs and police horses. They also spoke with shoppers, retailers and business partners to encourage them to act as the police’s eyes and ears and build a network of vigilance. As part of their work, the officers developed partnerships with Leeds City Council, Safer Leeds and Leeds BID in addition to engaging with a number of major businesses and shopping centres, including the Trinity Centre, Victoria Gate, White Rose. Safer Leeds chief officer Paul Money said: “The trial by West Yorkshire Police of Project Servator in Leeds city centre has achieved a variety of positive results, and we very much welcome that this initiative will now be available city-wide. Officers talk to shoppers in Trinity Leeds as Project Servator is rolled out across the district. Project Servator officers are trained to spot the tell-tale signs that a person may be carrying out 'hostile reconnaissance', which is the information gathering an individual carries out when planning to commit a criminal act, including terrorist attacks. Mark Burns-Williamson, West Yorkshire’s Police and Crime Commissioner, that using evidence-based policing and the latest research was a crucial step towards disrupting criminal activity and counter terrorism in all its forms. “Its purpose absolutely reflects the priorities I have recently outlined in my refreshed Police and Crime Plan, particularly in meeting our strategic policing requirements, as set out in legislation," he said. If you think someone’s suspicious behaviour could be linked to terrorism, it’s important to report it. Trust your instincts and ACT by reporting it in confidence at www.gov.uk/ACT or by calling 0800 789 321. Any piece of information could be important, it is better to be safe and report. You can help the police prevent terrorism and save lives.